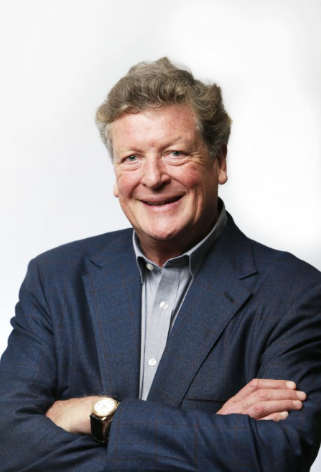 The SidebySide Partnership, the London venture capital firm founded by technology veteran John Bailye, has launched a technology EIS fund to support “scale-up” businesses. The Side by Side Partnership, a London venture capital firm founded by technology veteran John Bailye, has launched a technology EIS fund to support ‘scale-up’ businesses. A new fund is launched today which aims to be completely in tune with the Government’s strategy of encouraging the growth of young companies, beyond their initial success, as outlined in its recent Industrial Strategy document. GBI City Editor Neil Martin talks to its founder, London-based John Bailye. 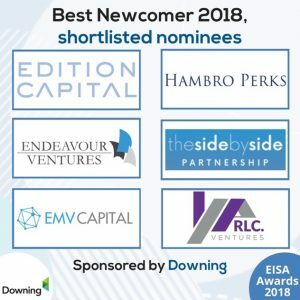 Catch up on Episode 4 of the new #AdviserHour series, with industry experts from Puma Investments, MMC Ventures, Newable Ventures, The Side by Side Partnership, Tony Catt and our host Lawrence Gosling. 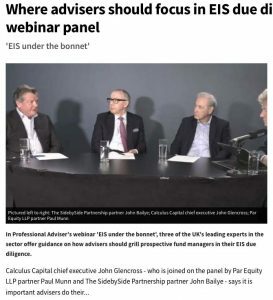 In Professional Adviser’s webinar ‘EIS under the bonnet’, three of the UK’s leading experts in the sector offer guidance on how advisers should grill prospective fund managers in their EIS due diligence. The investments referred to in this website are not suitable for all investors. The SidebySide Partnership International Limited is not able to give advice to prospective investors about the suitability of the investments. Prospective investors are recommended to seek specialist tax and financial advice before investing in the SBS Later Stage EIS Fund.An investment into the SBS Later Stage EIS Fund may only be made on the basis of reading in full the information set out in the relevant Information Memorandum. © 2019 The SidebySide Partnership International Limited. All Rights Reserved. The SidebySide Partnership International Limited is the appointed representative of Sapphire Capital Partners LLP, who are authorised and regulated by the Financial Conduct Authority in the U.K. with firm reference number 565716. Investing in start-ups and early stage businesses involves risks, including illiquidity, lack of dividends, loss of investment and dilution. It should be done only as part of a diversified portfolio. The SBS Later Stage EIS Fund investments are targeted exclusively at investors who understand the risks of investing in early-stage businesses and can make their own investment decisions. Any pitches for investment are not offers to the public.